Asiatic Cheetah or Asian Cheetah is one of the rarest cat species on the planet with a mere fifty to sixty individuals remaining in the wild. Once found in thousands from Arabian peninsula to India, it is now seen only in fragmented locations in central Iran. Also called Indian Cheetah it is now extinct in India. The name Cheetah is in fact a derivation from the Sanskrit (ancient language of India) word Chitraka, meaning 'the spotted one'. The fastest land mammal, Asiatic Cheetah, like other subspecies of this amazing big cat, is built for speed. A long and sleek body is balanced on slim, athletic legs with semi-retractable claws that enable the cat to maintain grip on ground in high speed pursuits. Weighing in the range of eighty to one hundred and fifty pounds, it is between four to five feet in length with a near two and a half feet tail that acts as a rudder to stabilize the Cheetah as it makes quick turns in hunts. Height is about two and a half feet. Fur color is tawny and hair are short and coarse. Black spots mark the length of the body. Head is small and eyes are high set. Dark tear like markings that run from the inside corners of eyes, across the side of nose to mouth are thought to protect the Cheetah's eyes from direct impact of sun's rays as it chases its prey in bright daylight. Residing in the barren lands of Iran, Cheetah is a traditionally a daytime hunter. In Africa this is an adaptation to avoid conflict with other bigger predators like lions, hyenas and leopards that are active at night. 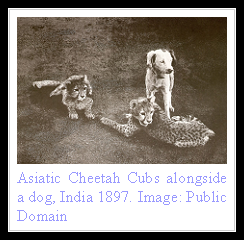 Little is known about the behavior and habits of the Asian Cheetah, though it is known to prey upon gebeer and goitered gazelle, wild goat and urial sheep. Cheetahs have strong jaws and kill by the throat hold that suffocates the prey animal. It is estimated that if they come within two hundred yards of the prey by taking cover from bush and grass, avoiding notice, then they have a reasonable chance of success in making the kill. Unlike other big cats, Cheetahs can be tamed and were used for centuries by maharajahs in India to bring down gazelle, earning the title of 'hunting leopard'. Acinonyx Jubatus Venaticus, the Asiatic Cheetah is currently recorded in desert and semi-arid shrubland in scattered regions in Iran. Some unconfirmed sightings have been made in the past in the Balochistan province of Pakistan, however there is no evidence to back them up. Cheetahs are to an extent migratory cats and often move around in search for prey. This is particularly true in case of females who don't hold as strongly to a territory as males. Not much is known about the reproductive profile of Asiatic Cheetah. Mid winter is believed to be the peak breeding season for the cats even though they have been documented to mate year round. Litter size is reported to be between one to four cubs with two being the average. Independence is probably reached at eighteen months. Lifespan is up to twelve to fourteen years. Cheetahs in general and Asian Cheetahs in particular are at the lowest point in their evolutionary history. A basic problem is their lack of genetic variability since they all seem to have evolved from a limited number of ancestors at one point in time several thousand years ago. This leads to a high mortality rate in cubs. The same problem is likely to have significant short and long term consequences for the Asiatic Cheetah which is under the significant threat of inbreeding. Desertification of their habitat, loss of prey, poaching and loss of habitat to agriculture and mining projects, are the main threats to this marvelous cat. There are conservation projects going on though. Authorities in Iran are reportedly taking interest in conservation of the big cat and collaborating with organizations like Wildlife Conservation Society and World Wildlife Fund to study and protect the feline. This enabled the successful collaring of the first Asiatic Cheetah last year, allowing the first opportunity to study the threatened cat in the wild that is currently classified as Critically Endangered. Thanks for this very thorough profile! I had no idea there were any subspecies of cheetahs. I like all type of Cheetah not only Asiatic Cheetah or Asian Cheetah.All cheetahs a re looking very good and nice. Because it is endangered and needs protection for its survival in nature. Rewilding Asia and North America-there are some proposals about bringing back lions and cheetahs to the grasslands of Asia and North America.It should be done with the Asiatic Cheetah(not the African one) and with purebread Asiatic lions.For bringing them to the North American prairies,possibly send Canadian Wood Bison (and possibly other species that are extinct in Asia but survive in North America in exchange for those that survive in asia but are extinct in North America)to the temperate countries like China and Russia and possibly Iran in exchange.Bison once roamed the entire tempreate grasslands,forests and subarctic regions of Europe,Asia,and North America.European bison would probably be the ones that roamed the regions west of the Ural Mountains.Everything east of the Ural Mountains was probably more related to the Wood Bison(unless fossils indicate otherwise in western Asia)being reintroduced to Siberia.Wood bison should also be reintroduced to eastern North America too.The way to obtain Asiatic cheetahs that will not reduce the ADULT POPULATION is to do what the Russions did with the Saiga antelope years ago to raise their numbers-take only the young for raising and captive breeding when the mother is away.Most cheetah cubs don't survive the first year anyways.Send only to zoos that have successfully captive bread the African cheeatahs since they are the ones most likely to succeed in breeding the Asiatic ones for release in India,central Asia and the North American Prairies. Asiatic lions which already have purebreads in zoos should also be reintroduced into the areas that have abundant prey but in different areas than the cheetahs. cheetahs are the champions of all sprinters. let's work hard together so we can restore the population of these beautiful and lightning fast creatures. when im older, i am going to help breed these big cats. they are my fave animal and i love cats!! this is my take on all these post about all things god created.if god put these animals here they are to stay here,it is his will. not are's who are we to try to eliminate his beauty which he created.only he is the keeper of time we are just another creation of his.we are to look at these animals from a distance and see the love of our god that gave us life god put here what he loved,just as he loved us.so who are we to try and destroy his beauty.this is the reason my native american ancestor always said let man keep messing with the balance of nature.eventually he will kill all humanity.as well.look at are hospitals today prime example almost nothing is pure anymore are land,meat,drinking water,is all chemical all just for money.and all of the sport hunting going on just as a prize to showoff.and people are keeping this tradition going on by teaching there kids to hunt just because they say the season is in.people have abused gods laws of the land,water,food, and habited.for the wild life.if you think this is not true why are there so many endangered birds and animals everywhere.and we are becoming the same way do to enviromentally suicide.by contaminating everything.we and the animals have to share the earth.onr way to stop this is by staying out of there space someplace we don't need to invade leave it to the animals give them there space don't try to build a house or a town that was in the deep woods where they roamed you don't supose to live there.so don't get your gun out when a bear or wildcat shows up.that just telling you your invading.you don't belong there.can you read the signs.also chemical on the crops you hunt the deer,rabbit,ect they drink the water.eat the crop your getting the poison right back when you eat them and also what the goverment is allowing them to inject in the food we eat when we go grocery shopping.look at all the sick people in the world all of this is killing the animals combine together and also you to and me.all this is genocide. lions and cheetahs only existed in north america in prehistoric times. You cant do that idiot. The only big cat north america has is the puma, it shouldstay like that. As it is Americans have poor animal control and conservation. You allowed to shoot anything you want. THis is coming from a guy living in a country which has lions and cheetahs, and seen them in the wild. If you consider somebody an idiot for proposing reintroducing Asiatic Lions and Asiatic Cheetahs into their former range which includes North America,than you must consider many people idiots who are involved with restoring species to their original range.Reintroducing Bison to Siberia and reintroducing the Bolson Tortoise to the desert areas of the southern United States are examples of species being reintroduced into their prehistoric range.Other people propose reintroducing camels and yaks to North America too.I guess you call those people idiots too. The Florida panther is threatened by burmese pythons. The same for the red fox, and other mammals. Why, then, is it that violent people have rights to own dangerous life forms, only to set them free, when out of hand, only to wreak havoc on humans and other mammals? It is thought that the above snake species might mate with a similar species that will result in an even larger menace. Some freaks would long to recreate such prehistoric monsters. WHY isn't there profiteering regarding Florida pythons, and the like, for manufacturing shoes, purses, and belts? Surely there is a means to solve this issue, rather than to let everything cruise along. Also that there are hunters permitted to kill lions and other mammalian predators for trophies in Africa? Such countries DO NOT NEED AMERICAN AID. WHY felines rather not dangerous serpents? is to be done for the welfare of both humanity and animals. Thanks fo the information about all of thses cats. It is one of the best blogs I have ever seen. I think that we should all help this species and its wrong not to feel sorry for these creatures. Cheetahs are amazing! This is a really good blog thanks this helps with my homework! should do everything possible to protect them in the best way to avoid their extinction! Thank you for giving me another point of view on this topic. Now I can easily complete my article. This a good way to appreciate the teacher as they put their efforts to train students. online BBA dissertation help UK dissertation Writers appreciates the teachers. It has to be a good thing to be here on this article and i was hoping for this info and then i have got many things from this article.Thanks for share this info and i wish for more updates here on this info.You did such a great job. Conservationists have warned that the Asiatic cheetah is on the threshold of extinction following a UN decision to pull funding from conservation efforts to protect it. Best product review site buy the best product with review and guidelines. That's so nice and interesting blog. Thanks to share it. I learned a lot of information from your post about animals. Keep writing your post. Asiatic Cheetah is one of the rare and dangerous cheetah in the world. their species is decreasing day-by-day. I am very scared about the Asiatic Cheetah. But it is very sad to know that they are very rare.